Dodge and Ram have decades of experience in car engineering and Rob Lambdin’s University Dodge service department wants to ensure your new or used Dodge and Ram vehicle is a high-functioning machine for its entire life. University Dodge is home of the “no bull” deal and that applies to our sales, service and parts departments. As a dealership that specializes in FCA-owned brands like Chrysler and Jeep®, all of our service techs are Chrysler certified and we primarily use Mopar-certified parts unless a vehicle requires a specialized part. Additionally, Chrysler offers a 2-year unlimited warranty on parts and labor. Whether you have a diesel or gas truck or a speed machine like a Dodge Viper or SRT Hellcat, our large team of skilled service techs can handle all vehicle repairs. By bringing your Dodge vehicle to Rob Lambdin’s University Dodge Ram for all your service and repair needs you can count on a continued driving experience for every single mile of your lease or ownership.Our trained service technicians undergo regular, frequent training, so they’re always up-to-date on every component of your vehicle. So each customer receives consistent and convenient service, the University Dodge service and parts departments work together resulting in timely, efficient and cost effective outcomes. The University Dodge service department is proud to be one of the nation’s FCA dealerships that offers FCA’s Express Lane Oil Change Service. When you bring your vehicle to the Express Lane, our goal is to complete all oil changes in 30 minutes or less. Rob Lambdin’s University Dodge sells new Dodge and Ram models, but we also sell a variety of used cars, and our service department services all makes and models. Regardless of where your vehicle was purchased, we treat all service customers with the same respect and honesty so they know they are in capable hands. When a vehicle is brought in for repairs, our service department works diligently to get our customers back on the road as soon as possible and we communicate with them every step of the way. After our service techs have identified the cause of the problem, we call our customers to inform them of the problem, the estimated time for repair as well as the estimated cost for repair. The SRT brand is a high-end performance brand that is a part of FCA and University Dodge is one of the top SRT dealers in the area, and our service department has service techs that are trained to complete skilled work on all SRT models. Additionally, we also have the parts and knowledge to improve engine performance on SRT and non-SRT vehicles. If you bring your vehicle in for service and your vehicle is still under warranty, University Dodge works closely with the manufacturer to get repairs completed as quickly as possible. New Dodge and Ram vehicles are covered with a 3-year or 36,000-mile basic limited warranty. Dodge and Ram vehicles with a gas powertrain are protected with a five-year or 60,000-mile powertrain limited warranty; Ram vehicles with a diesel powertrain are backed by a five-year or 100,000-mile powertrain limited warranty. Additionally, most Chrysler brand vehicles come with the 5-year or 100,000 mile roadside assistance service. Services included in the roadside assistance program include support with a battery jumpstart, roadside fuel delivery, flat tire service or towing to the nearest FCA US vehicle dealer. In addition to regular routine maintenance and vehicle repairs, the University Dodge service department also performs specialty upgrades, including lift kits, wheel and tire upgrades, and engine modifications. 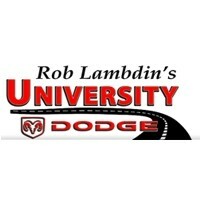 Rob Lambdin’s University Dodge is conveniently located at 5455 S. University Dr. in Davie, Florida and customers come from Fort Lauderdale, Miami, Coral Springs, Pembroke Pines and the other surrounding communities of South Florida. To get started with us today, give us a call at 954-271-1593 or easily schedule an appointment online to take your first step to a better experience in your vehicle. Like our parts department, we are open six days a week from Monday to Saturday. Don’t worry if you are too early or too late. We have for your convenience our Early Bird/Night Owl drop box. Just bring your vehicle, drop it off in front of the service department. Our after hours drop box is located right on the right front wall of our service department. Pull it open and fill out the envelope insert your keys and drop them in the box. One of our service advisers will contact you as soon as we open. Are you trying to save a little money when it comes to servicing your car or truck in Davie? Take a look at our car service and maintenance coupons. Living the tropics is nice, but the heavy rain and extreme heat in the summer months is harsh on vehicles. In the summer, it is important for South Florida drivers make sure that a couple car components are working in order to stay safe and comfortable on the roads. There are three car parts that are essential to combat heavy rain, tires, windshield wipers and exterior car lights. The service department at Rob Lambdin’s University Dodge can quickly and affordably replace wiper blades, tires and exterior lights. If you need any of these parts or service work done today, come by and see us for quick service! University Dodge is home of the “no bull” deal.